After hours of preparation, we devoured this in about 6 minutes. It reminded me of Thanksgiving – people spend the entire day cooking and prepping, all for 15 minutes of gastronomic pleasure. Like those Thanksgiving foods, this dish is worth every minute of effort! I recommend starting with the pasta dough, followed by the filling. Then, roll out and fill the pasta, and place it in the fridge while you work on the sauce. When the sauce is set to simmer (before you puree it), start your pasta water. By the time the water is boiling, you’ll be ready to puree the sauce. While the sauce is cooking, toss the pasta in the water for 4-5 minutes. Try not to skip the truffle oil – it adds an unexpected pop and depth of flavor that you won’t be sorry about! Place the flour on a clean working space or in a large bowl and create a well in the center. Add the eggs into the center of the flour and work the flour into the eggs until well combined. Add the water as needed to bring the dough together. Once the dough has come together, knead for 1-2 minutes until the dough is soft. Wrap the dough tightly in plastic and allow it to rest at least 20 minutes or up to 24 hours in the refrigerator. Before you roll out the pasta, let it warm up a bit. You can set it on the counter for 20 minutes or so. This will make it easier to work with. 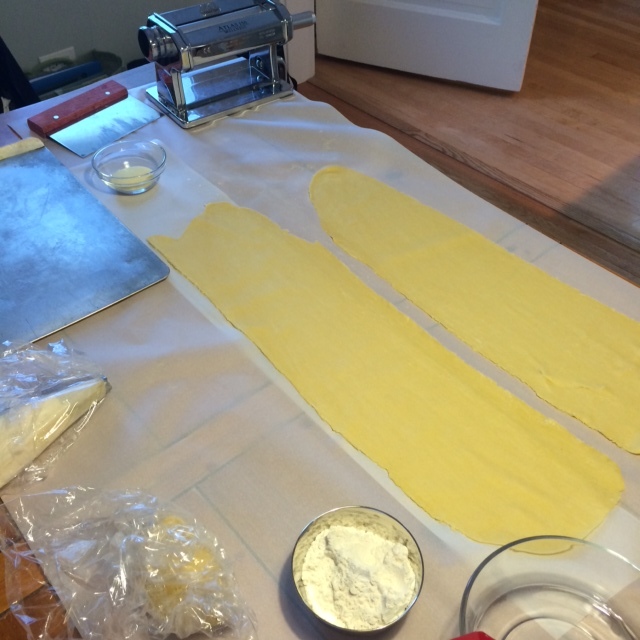 Roll the pasta out in a pasta maker until smooth – setting 6 is a pretty good thickness. 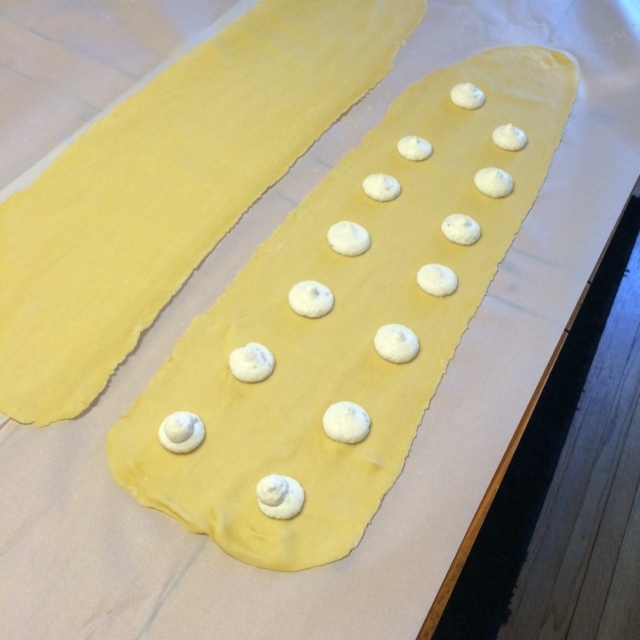 Using a piping bag or tablespoon, drop portions of the filling on the rolled pasta, taking care to space them evenly apart. Lightly coat the pasta with water and cover with another sheet of pasta on top of the filling. 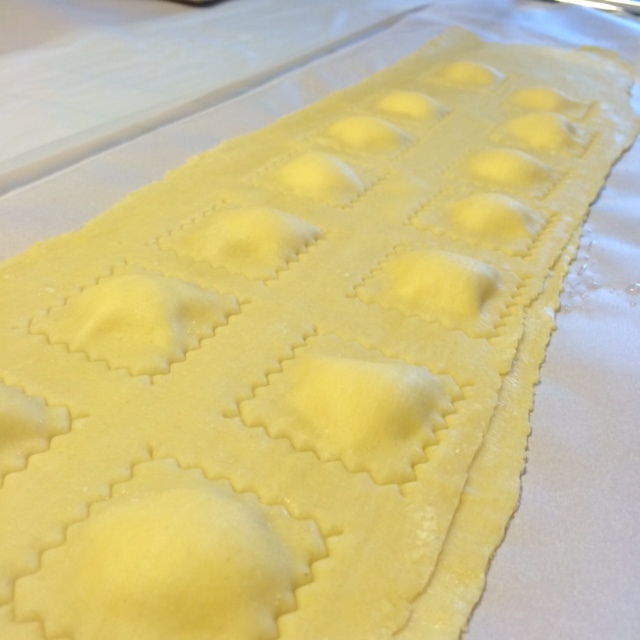 Seal each ravioli by pressing the two dough sheets together and releasing any air bubbles. Cut into squares using a pastry cutter or ravioli stamp. Dust the finished pasta with semolina. Pasta is ready to cook or can be stored in the fridge until ready for service. Pasta can also be frozen for future use. Combine ricotta, parmesan, herbs, salt and pepper in a mixing bowl. Season to taste. Filling can be made a few hours ahead. Preheat oven to 425. Toss squash with olive oil in a bowl to coat. Transfer to a flat sheet pan and roast for 20-30 minutes, until tender. Remove from oven and set aside. Heat butter until melted and slightly bubbly. Add shallot and cook until softened, about 3 minutes. Add stock and squash, bring to a boil and then let simmer until squash is tender, about 10 minutes. Put sauce back into pan and heat over low. Add cream and season with the salt and pepper. 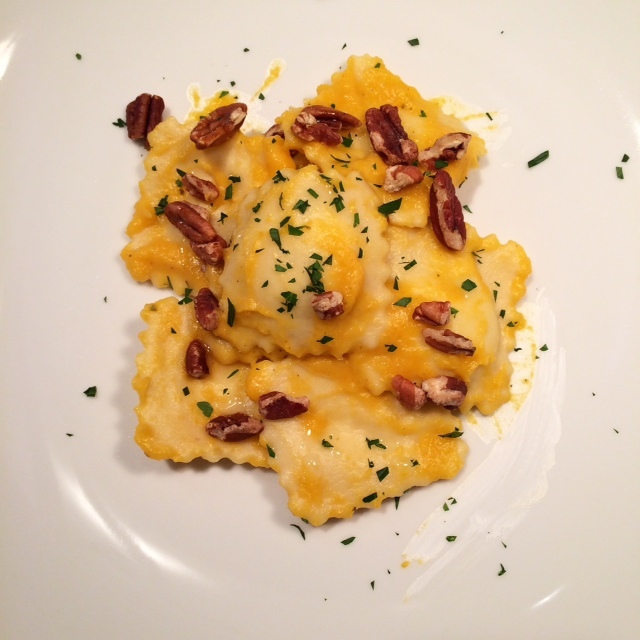 To serve, toss the pasta with the sauce and garnish with the pecans and parsley. Drizzle with truffle oil just before serving. That looks amazing. I love butternut squash!